When approaching an artwork, we recognize its situatedness in a particular sociohistorical, cultural context. In some sense, this helps us interpret its meaning. Perhaps in other ways, interpretation obscures or conceals meaning. Either way, interpretation’s important. So, let’s talk about the art of interpreting art (I am impossibly clever), and refer to Freud, Adorno, and Nietzsche in the process. Freud, because he’s occasionally insightful, but usually crazy. 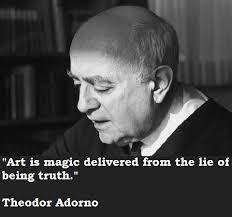 Adorno, because no matter how carefully I study him, he gets deeper, changes, and betrays me, and because he so effectively puts Freud in his (father’s) place. Nietzsche, because he belongs everywhere, he’s really never unnecessary. Mostly because these gentlemen are useful lenses through which to investigate the process of interpretation, especially its application to art. As the nineteenth century recuperated from the enormous impact of Kantian idealism, the predominant response emphasized a movement away from transcendental and abstract explanations of phenomena. While many philosophers and scientists embraced empiricism, for thinkers like Freud and Nietzsche, the rejection of idealism culminated with a turn inward, to the very source of perception and understanding. Ever skeptical of appearances, instead of interrogating observable, external reality, they sought to understand the relationship between that reality and the mind, with the assumption that the latter modulates experience of the former. As the early twentieth century ushered in a reliance upon abstraction and symbols, which were thought to capture reality more faithfully than perception or experience alone, the Freudian “hermeneutics of suspicion” became ever more relevant. It is illuminating to explore how the discourse of suspicion regards human ability to symbolically convey or experience truth, particularly through the medium of art, and what alternatives are suggested within the thought of Adorno. The intellectual atmosphere of the early twentieth century was characterized by brilliant innovation, rapid progression, and substantial transformation. Exciting new technologies, scientific and mathematical advances, and the developments in modern art all seemed to point in the direction of a new reality and a new understanding. Space and time, seemingly such concrete notions, were shown by Einstein’s relativity theory to be nebulous and relative, and the realm of sense perceptions ceased to be a reliable arbiter of certainty. As the invisible reality, laden with x-rays, electrons, and the secret truth of objects was gradually revealed, it became more and more apparent that the five senses and confined, positivistic schemas were impotent in the face of such an amorphous dynamic. New instruments were needed to capture it and a new language was needed to communicate it. Since nothing representational or experiential was capable of conveying reality, its expressions had to become entirely symbolic. To access the nature of space and time scientifically, it was necessary to rely upon mathematics, of which the elegant and abstract symbols presented reality more faithfully than perception ever could. However, mathematics was not reserved for science, since art, too, learned to approach nature “in terms of geometric forms, such as the sphere, the cone, the cylinder”. Eventually, even geometry became too representational, too bound to form and object, and the first entirely nonfigurative painting was created in 1910. The goal of nonfigurative art — representative of philosophy itself — was to rise above the distractions of mundane narrative to a more universal, more objective, vantage point. Once abstract enough, the artwork breathes a purer air, visually revealing not, let’s say, a flying bird, but the very essence of its lightness. If the artist’s intention is to visually evoke something approaching a universal truth, then a sophisticated and disciplined understanding of the artwork requires deciphering and translating visual content into meaning. Reliance upon symbols, then, is itself a reliance upon hermeneutics since the task of accessing what the symbol points to, whether mathematical or aesthetic, is an interpretive one. Approaching art in this manner, by taking for granted that its goal is truth and its tools are symbols refined of personal narrative, is to conduct the hermeneutical enterprise by faith. This type of interpretation aims at restoring meaning to the symbol, treating it like a deliberately crafted message, even if the message lies beneath the surface of the symbol. The symbol, in this case, is a manifestation of the message. A different interpretive approach, however, is characteristic of Freud and Nietzsche, who conducted a hermeneutics of suspicion, a “tearing off of masks, an interpretation that reduces disguises”. Nietzsche, perhaps the greatest un-masker of all, demonstrated that what seems most natural and self-evident is actually the result of a particular way of approaching and experiencing the world. Intellectual formulation is, for Nietzsche, a quest not for truth but for values motivated by the will to power which is itself motivated by terror of nihilism. This perspective mistrusts the symbol that is “there” but sees the underlying content which is “not there” and aims to unearth that which underlies and constitutes the symbol, to ultimately hold up the symbol as an illusion, as a manifestation of forces which it is not privy to. Freudian psychoanalysis is the most disciplined example of the discourse of suspicion, and it regards most symbolic content as a manifestation of a concealed content. Dreams, for Freud, are collections of symbols requiring interpretation to reveal how they are substitutive of the thought process and operate as wish-fulfillments, enabling the dreamer to continue sleeping by generating within him the illusion that his desires have been obtained. Such wishes may be obvious or repressed; the latter require the transformative power of the dreamwork, which conceals the latent content behind the cleverly constructed manifest content, allowing them to slip into conscious awareness. The result is often obscure, and analysis alone can interrupt the masquerade to reveal the latent content of a dream. The artwork functions the same way as dreams do, and is to be interpreted the same way dreams are. To apply the hermeneutics of suspicion to an artwork is to approach deciphering it with the prior understanding that the work is a visual representation, a projection, of the artist’s interior world. However, it is not the internal vision that comes into question, but rather the recounting of it through an aesthetic medium. As soon as the artwork comes into being and begins to communicate, it becomes an unintelligible disguise not for truth, but for the unconscious. Intelligibility is achieved not through a grasping of a truth, but through a substitution of attempt at truth with concealed desire, or, in Nietzsche’s case, with the will to power. Clearly, this constitutes an enormous challenge to modern art’s attempt to move beyond the biases of personal narratives and internal states toward essential truth. To thus undermine the symbol’s ability to point beyond itself to something more universal, to demonstrate that symbolic abstraction shines a light onto little more than its own constitutive foundations, is to revert the symbolic discourse into narrative, except of a trickier kind. Of course, the Freudian approach is not satisfied to merely tear off masks. Once the relationship between hidden desire and external manifestation is apparent, it becomes easier to apprehend understanding itself. Perhaps paradoxically, undermining the pursuit of truth brings us closer to truth. By revealing the hidden dimensions of the mind, psychoanalysis aims to overcome neuroses, and the Nietzschean mode of suspicion aims at “the increase of man’s power, the restoration of his force”. However, what of the man who does not seek either power or freedom from neuroses but, in the simplest terms, pursues not self-improvement but access to truth? The discourse of suspicion has a “suspicious” similarity to the Kantian idealism Freud rejected – it, too, employs a totalizing gesture when it reduces symbols to subjective desire. Psychoanalysis grounds art firmly into the social sphere, preventing it from evoking universal notions, and in its reductionism, belittles the communicative power of the artwork. Such is the essence of Adorno’s critique of Freud’s conception of art: Freud’s over-emphasis on unconscious drives denies the artwork elements of autonomy necessary to transcend local contexts for the purpose of critically reflecting upon, or polemicizing against, those contexts. “In the process of artistic production, unconscious drives are one impetus among many,” Adorno tells us, because the crafting of symbols is a dynamic process, not merely a result. The symbol, then, is not only the reflection of the structure which constitutes it, is not only a disguise; it is also a meaningful engagement with objectivity, possessing revelatory power which can be extended beyond the latent desires of an individual subject. If one wishes to preserve art’s autonomy, one must either afford the dream symbols a larger scope, or suppose that the artwork does not function as the dream does, is not purely psychic phenomena. Perhaps, as is so often the case, truth dwells somewhere in the middle. Perhaps the hermeneutics of suspicion and of faith are not doomed to be antagonists, wherein one or the other method prevails, but may rather become the guardians of an inner tension that includes, and whose conclusions are superior to, either approach alone. To restore meaning to the symbol with one hand, and to sweep aside its illusions with the other, is not a gesture of contradiction or of cancelling out, but an inclusive, dialectical movement of reconciliation and evolution. The enigma of Mona Lisa’s smile need not be understood only in terms of Leonardo’s relationship with his mother, the legitimacy of which does not preclude its evocation of something more essential and universal, something that had nothing to do with Leonardo’s personal history and which the symbol is nevertheless able to glimpse. To continue with Adorno’s perspective, since an artwork can never be fully deciphered, since its language cannot undergo complete substitution by a different text, there is a limit to the hermeneutical project. Deciphering must end where the aesthetic experience begins, delimiting for art an autonomous space where interpretation and substitution cannot follow. However, hermeneutics can absorb this limit into itself and make the aspect of uncertainty a part of its processes.